The State Department is sharing ideas with Kenyan leaders about technology sector growth as the country positions itself as the top IT hub in Africa. State Department officials visited Kenya this month to meet with leaders from government, industry, and civil society to discuss new ways that the United States and Kenya can work together. The State Department met specifically with Francis Wangusi, director general; Ngene Gituku, chairman of the Communications Authority of Kenya; and Samuel Itemere, principal secretary at the Ministry of Information, Communications and Technology. These government leaders said that they are working to craft policies that encourage growth in the technology sector. Ninety percent of Kenyans have access to mobile phones and 85 percent have access to the Internet. That compares to 84 percent of American adults that had access to the Internet in 2015, according to Pew Research Center. The U.S. and Kenya have similar numbers of cellphone ownership and Internet access. “One of the first things I noticed is that cellphones were ubiquitous and that Kenyans were using them the same way that Americans use debit and credit cards,” Julie Zoller, acting U.S. coordinator of international communications and information policy, wrote in a blog post. Kenyans use an app called M-Pesa, a mobile money platform, to safely transfer funds and pay for goods and services rather than using credit cards and accessing major banks. Kenyans made 400 million money transfers worth approximately $5 billion in the third quarter of 2016 using M-Pesa. 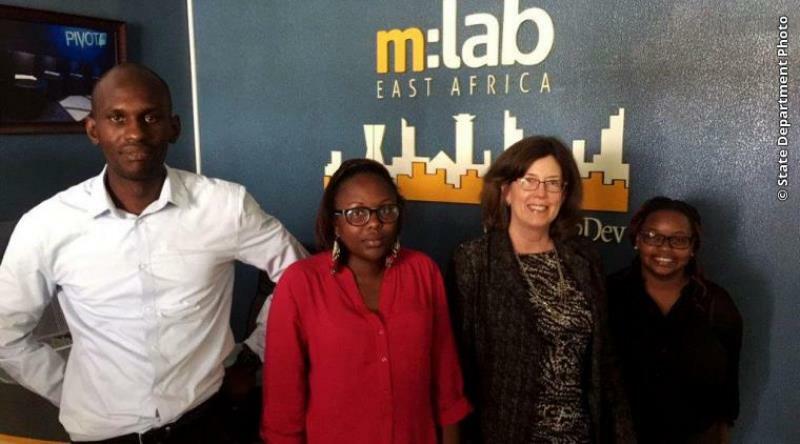 Zoller visited iHub, a Kenyan company that provides space for startups to collaborate and launch new technologies. Two such startups include Ushahidi and BRCK. Ushahidi is a crowd-sourcing app used to locate crisis areas during elections and natural disasters. BRCK provides broadband solutions to rural areas using a mobile, solar rechargeable Wi-Fi device. “Because 65 percent of Kenyans are under 35, it is crucial that Kenyan companies create jobs and opportunities for the emerging generation of aspiring entrepreneurs,” Zoller said. The State Department sponsors the WeCreate Center in Kenya that encourages female entrepreneurs to start or expand their businesses. U.S. companies including Microsoft, IBM, MasterCard, and Cisco all send technical expertise to their offices in Kenya. Andela, a software developer, recruited an all-female cohort in 2017 for its branch in Kenya. Andela hosts a four-year paid technical leadership program that trains cohorts of African residents to be elite software developers. “Having an all-female cohort encourages women to venture into tech as it counters the narrative that tech is a male-dominated field,” said Wambui Kinya, chief strategy officer of Andela. Zoller said that the success of startups will create more jobs for Kenyans.